Homes in the northern U.S. are treated to a measure of effortless outdoor decorating for fall: Nature does most of the work by turning the trees a vivid palette of reds, oranges and golds. Add a pumpkin or two on the doorstep and the look is complete. Rustic White Photography/The Associated Press To take advantage of the gorgeous autumn weather at his mountain house, designer Brian Patrick Flynn added a modern fireplace. To enhance fall style, Flynn changes up throw pillows in October by swapping summer-toned pillow cases with those more suited for autumn. Rustic White Photography/The Associated Press An outdoor dining room by Brian Patrick Flynn showcases the designer's love of hosting Thanksgiving outdoors. Flynn suggests setting up a table for 10 in a covered outdoor area, surrounding yourself with plants in yellow and orange tones and keeping the space warm with outdoor space heaters. 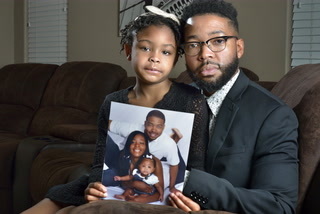 Rustic White Photography/The Associated Press When entertaining in the fall, designer Brian Patrick Flynn likes to keep things casual by dining outdoors not only to look at the beautiful fall foliage, but also to take advantage of the brisk weather. 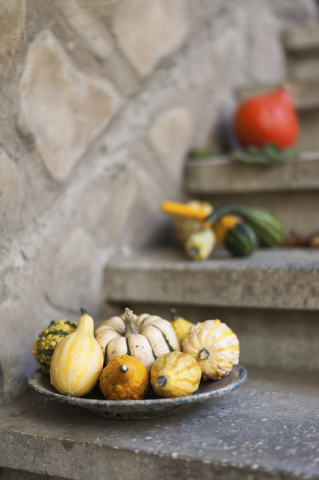 Thinkstock Gourds of various colors can be used for fall outdoor decor. In the rest of the country, it takes a bit more creativity to add the season’s colors and textures to the exterior of a home. Southern California designer Betsy Burnham says poorly done fall decorating can look out of place in warmer climates. Many homeowners aiming for a festive fall look go overboard with big decorations and harsh shades of orange. But with a light touch and some strategic choices, homes anywhere can be made more attractive through the beauty of the season. 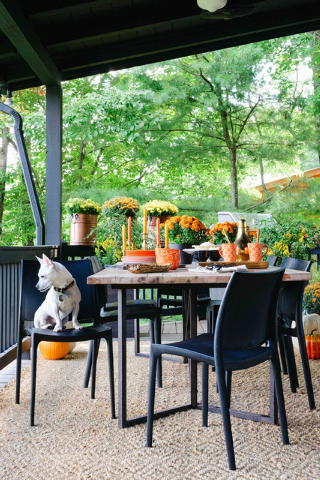 Here, Burnham and two other designers — Brian Patrick Flynn of the Flynnside Out design blog and Lee Kleinhelter, owner of the Pieces design store in Atlanta — offer advice on doing outdoor fall decorating right. If you’ve been hanging up the same fall wreath on your front door for several years now, Burnham suggests a fresh approach. Kleinhelter suggests using “rustic elements to complement this time of year,” such as birch logs, twigs and vines. They can be left in their natural colors or painted white or a soft shade of gold. She also likes decorating with “the fiery fall foliage of gingko and sugar maple trees,” which can be potted and clustered together in simple arrangements around a front door or in an outdoor entertaining area. 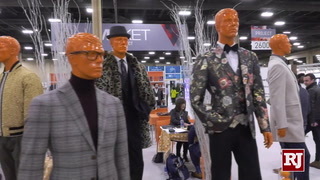 “They make such a beautiful impact, really popping with color,” Kleinhelter says. Outdoor cushions in summery colors can be replaced with warmer, autumnal shades. And Burnham suggests using clusters of scented candles outside in cinnamon, clove or other seasonal fragrances. Depending on your climate, Flynn even suggests hosting Thanksgiving dinner outside. Space heaters and a roaring fire can keep guests warm in most parts of the country, even on a November evening. And candlelight on the table adds to the drama. You can decorate with gourds and pumpkins without adding “that crazy pumpkin orange” to your home’s exterior, Burnham says. 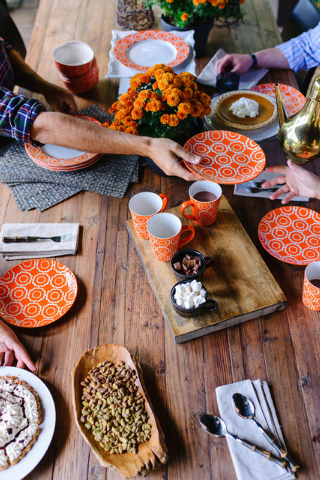 Instead, pick other shades of orange and yellow that feel seasonal but aren’t quite so bright. “You can never go wrong with white lights,” she says. “You can do a lot with just framing your door with really beautiful white lights,” perhaps woven through twigs or vines. The look is glamorous, and also practical: If you’ve lined your front door with white lights woven through twigs in the fall, simply add some pine or holly branches to the mix when it’s time to decorate in December.